Create a custom time and day system with the event system and game variables. This can be easily done by using three game variables for minute, hour and day (of the week), a simple game event that counts the time and a global event that automatically calls that event periodically. First, we want to set the initial values for the game variables to start at 8:00 on Monday (day 1). Open the ORK Framework editor and navigate to Game > Game Settings and change the following settings in Initial Game Variables. We’ll also add another variable to optionally block the time from increasing (e.g. during certain parts of the game). Click on Add Game Variable to add our first variable (minute). Click on Add Game Variable to add the next variable (hour). Click on Add Game Variable to add the last time variable (day). The week starts with day 1 (Monday) and ends with day 7 (Sunday). Click on Add Game Variable to add the block variable. That’s it for the inital game variables – click on Save Settings to save the changes. If you want to set the time and day to a specific time/day later in the game, you can just use the above settings for minute, hour and day in a Game Event using Change Variables event steps. It’s time for our time/day event – navigate to Events and click on New Game Event to create a new game event. 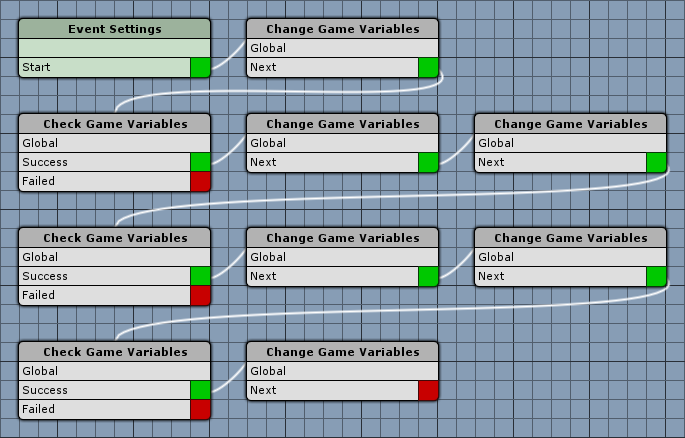 As you can see, it’s a series of changing and checking game variables (our minute, hour and day). Make sure to disable all the blocking options, otherwise the event will keep blocking the game for a short amount of time periodically. First, we’ll increase minute by one. Now, we’ll check if minute is 60 (i.e. a full hour). Connected to the previous check step’s Success slot, so we’ll set minute back to 0. It’s a full hour, so we’ll increase hour by one. Next, we’ll check if hour is 24 (i.e. a full day). Connected to the previous check step’s Success slot, so we’ll set hour back to 0. It’s a full day, so we’ll increase day by one. Finally, we’ll check if day is 8 (i.e. start of a new week). Connected to the previous check step’s Success slot, so we’ll set day back to 1. And that’s it for the event – click on Save Event and save the event as timeDay in Assets/Events/. We’re using a global event to periodically run our timeDay event and increase the in-game time. Navigate to World > Global Events, add a new global event and change the following settings. Set to Time and Day. Select our timeDay event file. These settings define how this global event will be executed – in hour case we want it to run every 2.5 seconds, resulting in a day in-game being an hour in real time. Next, we’ll select the Required Game States – this determines when in the game the event will be able to run. To only execute the event while the player is in control, not while in battle, menus, shops or events, set up the following game states. Finally, we’ll add the variable condition using our timeRunning to only run the event while this is enabled. Click on Add Game Variable. 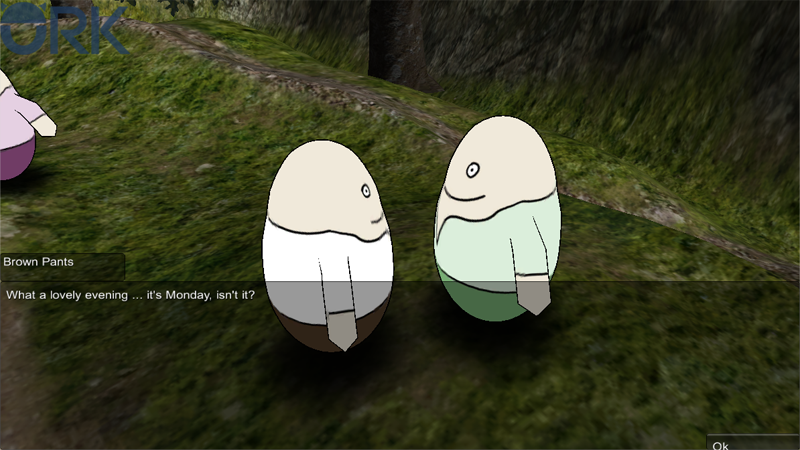 We now already have a fully fledged time and day system in our game! To make things depend on the time or day, we’ll use Variable Conditions, e.g. in event interactions, item collectors or combatant spawners. For this, we’ll need three variable conditions with Needed set to All. First, let’s check the day. After that, we’ll need two conditions to check the hour range. That one is pretty simple and can be done with a single condition. This time we’ll need two conditions and Needed set to One. We’ll need two conditions with Needed set to One. In the evening, we’ll check for hour greater than 17. And in the morning for hour less than 7. And that’s it – you can use those variable conditions as a template for your own. Keep in mind, if you want to use multiple times of a day, you can always add multiple interactions to an object.